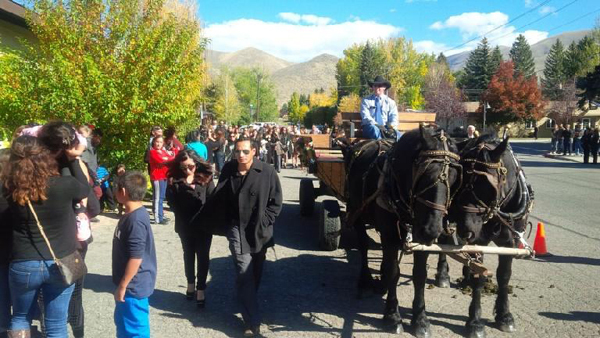 Hundreds of people followed a horse-drawn wagon carrying the remains of Hailey resident Humberto Herrera through the streets of Hailey on Monday. The procession arrived at St. Charles Borromeo Church for a ceremony, before continuing on to the Hailey Cemetery. Herrera, along with his brother Rodrigo Herrera, was a successful restaurateur. They recently purchased Vintage restaurant in Ketchum. Herrera, 35, was stabbed to death outside a Boise nightclub early last Thursday morning. According to the Idaho Statesman, a Boise prosecutor is alleging that Parley L. Ward and Phillip D. Law left in a vehicle from the Torch Lounge after security officers broke up a fight, then drove around the block and confronted the victims a second time. During arraignment on Friday, Deputy Prosecutor Dave Hunt told Magistrate Judge Theresa Gardunia that Ward, 32, grabbed Herrera from behind, placed him in a choke hold and fatally stabbed him in the chest, the Statesman reported. Hunt alleged that Law attacked a second victim, a Boise resident in his 20s. That man was able to get away. He was taken to an area hospital, where he was treated for injuries that are not life-threatening. Ward is charged with first-degree murder, which covers premeditated killings, and aggravated battery. Law, 30, is charged with aiding and abetting first-degree murder and aiding and abetting aggravated battery. Both men could face life in prison or a death sentence if convicted of the murder charges. The battery counts carry a maximum 15-year sentence. The men are scheduled to return to court Oct. 31 for preliminary hearings. Witnesses told Boise police Thursday that the fight began over a taxi cab. Hunt did not mention that in court. The two suspects ran from the club and a police officer responding to the scene saw two men matching the suspects’ description walking near North 28th and West Idaho streets. The men ran when the officer approached. A police dog located the men behind nearby Whittier Elementary School. They had blood on their clothing and Ward had a knife with blood on it, Hunt said. A judge set bail for the two men at $1 million, reported the Statesman. In court, both men responded briefly when Gardunia asked whether they might be able to raise the money. If a defendant remains in custody, a preliminary hearing must be held within 14 days. If the person is out of jail, that time can be lengthened to 21 days. “I would if [the bond amount] was less,” Ward said. “It isn’t, so I’ll take that as a ‘no,’ ” Gardunia said. Law said he didn’t expect to raise the bond amount. “No, not a chance,” he said. Members of the Herrera family in Hailey could not be reached for comment.